Product #30830 | SKU XK-1305-CFGR-BU | 0.0 (no ratings yet) Thanks for your rating! 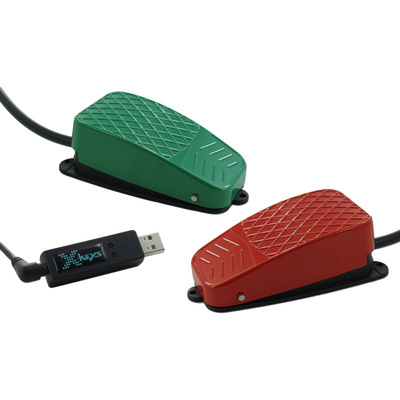 The X-keys XK-3 USB Switch Interface features 3 dual switch ports in a compact, low profile footprint. Easily convert any switch closure to a keyboard, multimedia, or mouse command. Switches are easily set up to launch applications, open files, or type short lines of text like names, addresses, and account numbers. Switches are connected via Assistive Technology standard 3.5mm (1/8") phone plugs MacroWorks 3 software for Windows and ControllerMate software for Mac OS-X combine ease of programming with a wide and flexible range of options. The XK- 3 USB Switch Interface may also be configured as a standalone USB keyboard or compound HID device with macros programmed in onboard non-volatile memory.